Ages ago I got an invite to spend the afternoon shooting recurve bows in an Essex woodland, and when diary's and childcare and work all worked out: what an afternoon it was. I journeyed to Romford; an easterly commuter town in Essex, where the girls are bright orange, and the Louis Vuitton handbags are made in China, to meet with my new friend Stickman from the British Bowhunters forum for a lesson in instinctive archery. And what a revelation it was. My previous efforts at target archery were less than distinguished. All that squinting at a pin wasn't making things easy and the lesssons were on a one-shot-and-get-to-the-back-of-the-line basis which didn't help either. I knew I wanted to learn to shoot 'instinctive', I just wasn't sure how I was going to. hard won, without the surgical strike at 100+ yards of a hunting rifle, field-craft and even dumb-luck become big parts of the contest. At these distances the chance to even draw the bow in the presence of an animal a major achievement. This is hunting at 15 yards or less. Hunting on an unlevelled playing field. One tale that he regaled me with illustrates just how much skill (and luck) is involved in hunting bare-bow. Stickman had been hiding in a blind near a water-hole when a 'Big Impala Ram' in fact the big-impala-ram-of-a-lifetime, had approached the water-hole coming within 15 yards (i.e 45 feet) of the blind Stickman was hiding in. Having been practising to the tune of 500 arrows a day in preparation for the hunt, he drew back and loosed an arrow. Only to be String Jumped. The arrow was travelling at approx. 200 feet per second, lets call the distance 50 feet to make it easier, so in a QUATER of a second the Big Impala Ram was able to sense the movement of the arrow and spring into the air letting the arrow pass harmlessly underneath him. It gets better - if we call the speed of sound 1200 feet per second that means that the sound of the bowstring got to the Big Impala Ram in a twelfth of a second. When the sound of the string arrived at the Big Impala Ram in the next sixth of a second the Big Impala Ram had taken flight. literally. Stickman had invited me to the woods his archery club use for 3D archery - instead of the circles on an straw board the targets are various prey animals, there is a tradition of throwing in a couple of humorous examples. 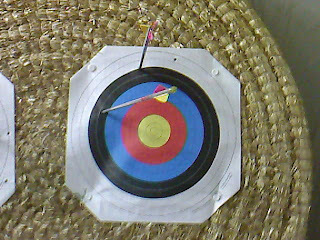 My first shot was a master stroke of beginners luck, Stickbow was impressed, I was double impressed!! Obviously once I started thinking about what I was doing I was back to my usual lummox self. Where I would have remained if it hadn't been for the light touch of Stickman's coaching. In between the banter and storytelling he paitently coached me to - actually hitting the target! Both eyes open, none of that squinting and aiming malarky, just launching arrows that either grazed the target or pounded into it! Yea instinctive archery! "Call for Mr O'Shay, a Mr Rick O'Shay?" Ok There were a few that went astray. Although sometimes the arrow, seemingly by magic. regains its trajectory, usually it's found embedded in a tree. If you're lucky. 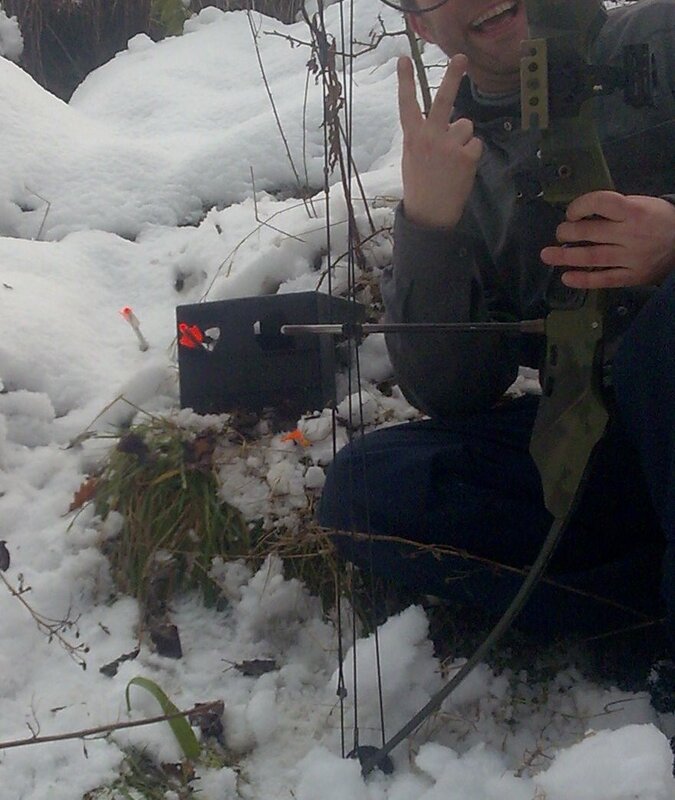 A large part of the sport is the time spent searching for lost arrows, not always successfully. Opps! Sorry Stickman. I was defiantly well taken with Bare Bow and even felt the first throbbing certainty, that tickle of obsession yet to come, archery is a lot like casting when fishing. The first time you cast perfectly you're hooked, the simple elegance of the motion, the economy of movement and the cybernetic connection between spring and soul. Launched by love and magic the arrow seems to fly on the wings of intention. Once. So many hobbies, so few pounds to spend on them. Such is suburban life dear reader.